Ethiopia Liân-pang Jîn-bîn Kiōng-hô-kok (Amharic-gí: የኢትዮጵያ ፈደራላዊ ዲሞክራሲያዊ ሪፐብሊክ; Eng-gí: Ethiopia) tiàm-tī Hui-chiu tang-pō· ê kok-ka, bô óa-hái. ↑ "Article 5" (PDF). Ethiopian Constitution. WIPO. 2 July 2015 khòaⁿ--ê. 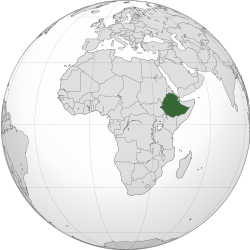 ↑ "Ethiopia". The World Factbook. CIA. 18 January 2013 khòaⁿ--ê. ↑ "Country Level". 2007 Population and Housing Census of Ethiopia. CSA. 13 July 2010. goân-loē-iông tī 14 November 2010 hőng khó͘-pih. 18 January 2013 khòaⁿ--ê. ↑ 5.0 5.1 5.2 5.3 "Ethiopia". International Monetary Fund. 7 December 2015 khòaⁿ--ê.